To commemorate the 5th anniversary of Michael Jackson’s passing I’m posting my 6 Favorite Post-Thriller Michael Jackson Releases from 1984 (very specific – I know – but the list fits perfectly within the theme of this blog and the focus of my obsessions). These are the best songs either sung, written or produced by MJ that came out in the great (greatest) year of pop. Joining me to discuss today’s song is Cutie Pie, the author of my absolute favorite Michael Jackson blog – All Things Michael! Coming up today . . .
1) Hit ‘play’ on the youtube link below. 3) While listening, stand-up and dance and perform backing vocals as if you were Randy or Marlon or Tito joining your brothers Jermaine and Michael for a command performance. If you followed those steps you just shared my experience of re-discovering this song after a couple of decades of forgetting it ever existed. There’s much to love about this record and Cutie Pie agrees! She calls it, “a beautiful collaboration between the two brothers. Their harmonies are strong and smooth.” I’d like to imagine the two of them in the recording studio falling into old rhythms and pulling a lifetime of experience and habits together to make this song. So if this song is so good – why didn’t it become a hit? Cutie Pie reminded me that the song was never officially released as a single because of legal issues between Michael’s label and Jermaine’s label. The song was only on the B-side of Jermaine’s single, “Do What You Do” but still received quite a bit of airplay. Someone get Cutie Pie a time machine, I think she’d use it very responsibly! Just the Facts: The song was nominated for a Grammy for Best Performance by a Duo or Group. Favorite Moment: The fact that you don’t hear Michael’s voice by itself until 1:27 into the song. That’s a nice bit of younger sibling/bigger star generosity. 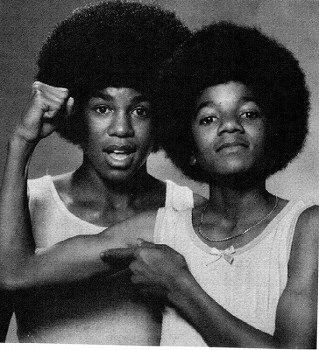 This entry was posted in Michael Jacklson, Tribute and tagged 1980s, 1984, Culture, Jermaine Jackson, king of pop, Michael Jackson, Music, nostalgia, POP CULTURE, Pop Music, Tell Me I'm Not Dreamin' on June 26, 2014 by Sean. Reblogged this on ALL THINGS MICHAEL! ♥. …As I sit here nursing my 4th glass of Red Wine, and listening to the ‘Breakin’ ” Soundtrack (which came out in Pop’s Greatest Year), I would like to Thank the Blogger who came up with this WONDERFUL blogpost about Pop’s (TRULY) Greatest Year….1984. Growing up I have Decades of Great Musical Times, but 1984 truly hold THE most nostalgic value, for the same purposes this Blogger has; The MOMENTS. The moment Van Halen’s “Jump” hit#1, The time I had to re-purchase “Purple Rain” because I played it literally until the grooves wore out; listening to American Top 40 and hearing “Sunglasses At Night”, “Desert Moon”, “I Feel For You”, “Better Be Good To Me”, ” Wake Me Up..”, “Modern Day Delilah”, and a new ditty called “Like A Virgin” ALL AT THE SAME TIME! AND, I’ve been saying it since The Land Before Time, if you were an 80’s Artist you HAD a hit in ’84! Tina, Bruce Dave & Annie, Madonna, H&O, Lionel….Good Times, Good Times. I am 2 years shy of 50YO, and even though I know Life & The World evolves, I find it amazing that MUSIC can transport your Heart & Mind to a time where everything FELT GOOD….and for me (and this Blogger), they will NEVER leave. PLEASE KEEP POSTING THESE MOMENTS of yours, and hit EVERYONE please (..do something on the “VIRGIN” phenomenon)! Rob – thank you so much! Your comment could not have come at better time. I really appreciate the fact that you’ve found the blog and that you are enjoying the content! As an 1984 aficionado you know that the best is yet come – Bruce, Huey Lewis, More Prince, Madonna, Band Aid, Frankie and so many more great bands and great songs!